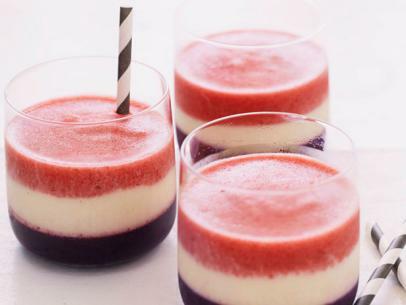 Create a fun, triple-layer super-powered fruit smoothie by freezing in between layers to hold the shape. For the blue layer: Pour the pomegranate juice into the blender. Add the bananas, blueberries, ice and honey and blend until smooth. Pour into the bottoms of four 8-ounce glasses and tap the glasses on the countertop to help even the layer. Freeze while preparing the next layer. For the white layer: Rinse out the blender and pour in the orange juice. Add the ice, yogurt and bananas and blend until smooth. Pour the white layer on top of the blue layer in the glasses, again tapping the glasses on the countertop, and then return to the freezer. For the red layer: Rinse the blender once more and pour in the pomegranate juice. Add the strawberries, bananas and ice and blend until smooth. Pour the red layer on top of the white layer. Keep in the freezer until ready to serve.